Sprained Ankle - Definition, Anatomy and Causes (Video) - Jeffrey H. Berg, M.D. 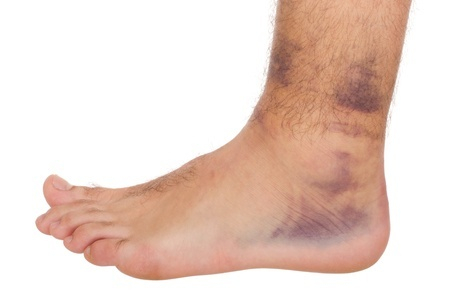 A sprained ankle is one of the most common bone and joint injuries. It often occurs during sports but can occur with everyday activities as well. It is estimated that about 25,000 ankle sprains occur each day. These bones form a relatively stable joint that is secured even more by a number of strong, thick and flexible bands called ligaments. These ligaments run from one bone to the other, helping to hold them together. 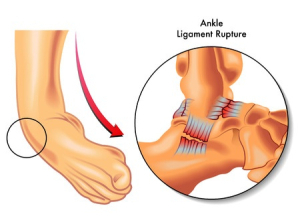 In addition, the ankle is further stabilized by the muscles and tendons that cross the joint. Stretching or tearing of a ligament is a sprain. This is not to be confused with stretching or tearing of a muscle which is a strain. When the ankle is sprained, the ligaments on the outside (lateral) of the ankle are the ones most commonly stretched or torn. This leads to local bleeding, swelling and ultimately bruising. Due to gravity, the swelling and bruising will often flow to the lowest point of the leg, usually that includes the foot. 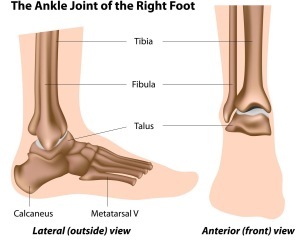 Additionally, the opposite, inner (medial), side of the ankle is often injured as well. This is usually an impaction injury that results in local soft tissue and bone bruising as well as local swelling. On occasion, additional injuries may occur. Other ligament tears, breaks in the bone and injuries to the cartilage surfaces and lining of the joint are among the more common additional injuries. The most common cause of a sprained ankle is a twisting injury, most often when there is an uneven surface, as may occur during sports such as soccer or in basketball when the player lands on someone else’s foot following a jump. Ankle sprains also frequently occur with everyday activities such as during a fall or stepping off a curb. 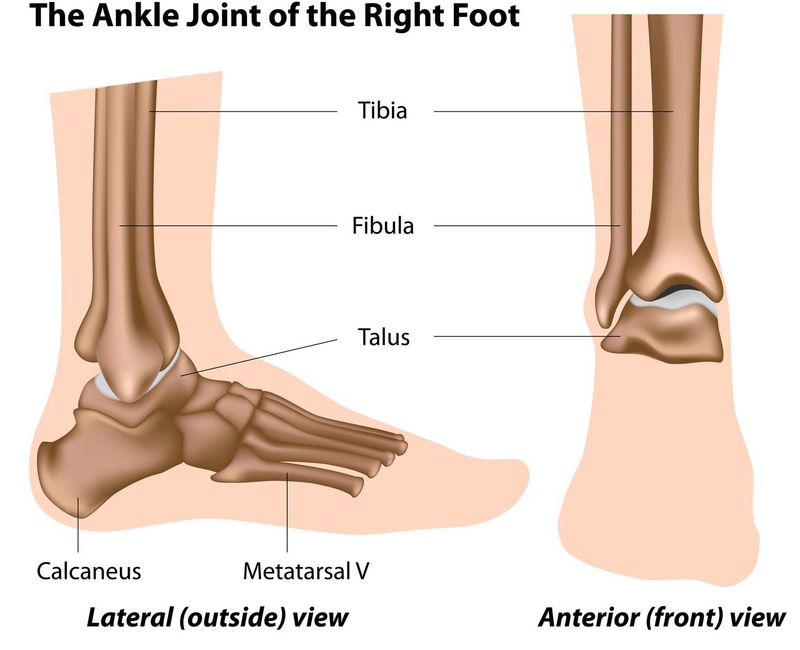 The mechanism for the most common “lateral” ankle sprains is inversion. That is, the ankle turns inward so that the outside and top of the foot and ankle begin to turn over. In the video below, Matt Holliday sustains a right lateral sprained ankle (0.30 secs, slow motion). 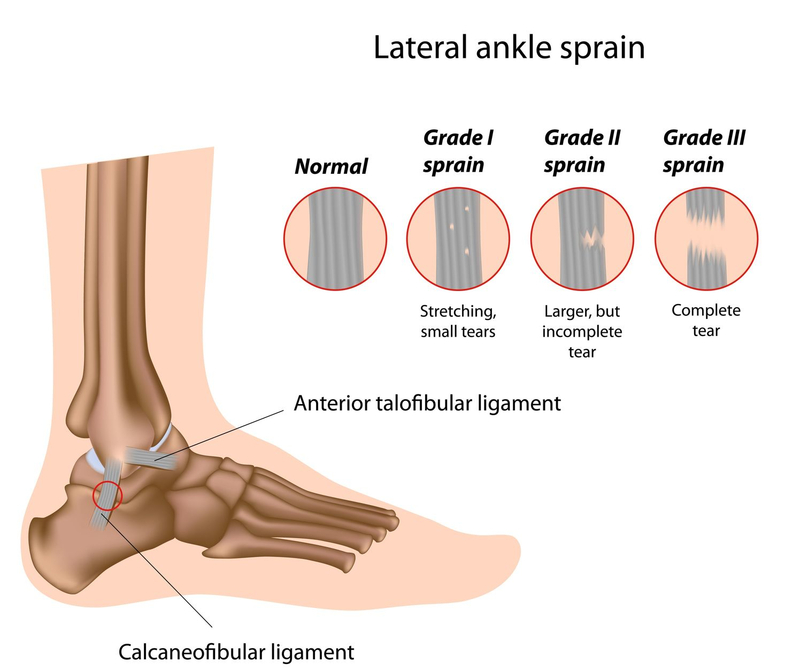 There are less common types of ankle sprains that occur from other injury mechanisms. A “deltoid” (medial ligament) sprain occurs during an eversion injury. This is essentially the opposite of the more common lateral ankle sprain. The ankle and foot get forced outwards with the inside of the ankle coming in close approximation to the ground. A “high” (syndesmotic) ankle sprain is an injury to the ligaments that connect the tibia and fibula at the ankle joint. These are usually injured when the foot and ankle are forced upwards towards the shin or are rotated outwards away from the other leg.